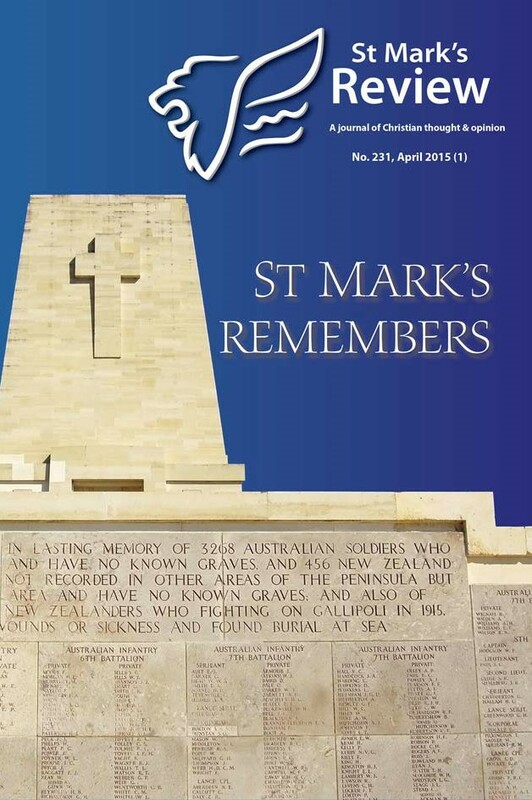 This thematic issue ‘St Mark’s remembers’ on ‘remembering Anzac Day’ is, in the best sense of the term, a smorgasbord, in both its varied intellectual and disciplinary approaches to the issue and in the differing literary forms through which the topic is engaged. While any given reader is unlikely to find every article equally to their interest or taste, they are equally unlikely to come away from the issue without having found some items that they will reflect on and come back to. The editor, Dr Michael Gladwin, is a church historian and the author of a recent published history of Australian Army chaplains. He has clearly drawn on his engagement in this field to gather together a diverse range of contributors. While it is the second set of articles that are likely to attract the attention of the readers of this website, the first few pieces are, I think, worth attending to, for what they say about contemporary Christian reflection on questions of war and peace and similarly what they have to say by way of evidence on the way Anzac Day is being practised and interpreted within the Australian armed forces today. These articles can, I would judge, be read with profit by both insiders of the Christian community – as a contribution to the conversations within that community on some critical issues – and by outsiders to that community. I will say little about the theological pieces apart from commending the powerful opening piece by Andrew Cameron, Director of St Mark’s, in which he draws appropriately from the work of Karl Barth, whose own commitment to theology in a new key was provoked by how German theologians approved their nation’s engagement in World War I. I will also resist the temptation to engage critically in this context with the contributions from chaplains which deserve discussion within the Christian churches. What I can most helpfully do is to note several of the articles which contribute something fresh to the historical and sociological interpretations of Anzac Day and its reception within Australian society. The pieces by John Moses and Frank Bongiorno provide more in the way of surveys of current debates rather than breaking new ground and are likely to be most helpful for those seeking to orient themselves to developments in scholarship and ongoing controversies. The next few articles represent scholarly work which casts fresh light on issues from a variety of interesting and relatively unexplored angles. Daniel Reynaud explores ‘Religion and the Anzac legend on screen’, taking us into the world of popular culture. Greg Melleuish brings into focus the connection between Anzac and Protestant sectarianism and the controversy over Britishness, through the career of the Reverend C D Forscutt. Raymond Canning takes up a family perspective through an exploration of the involvement in war of his great-uncle, his interaction with chaplains, a questioning of how we might appropriately remember and what remembering involves. 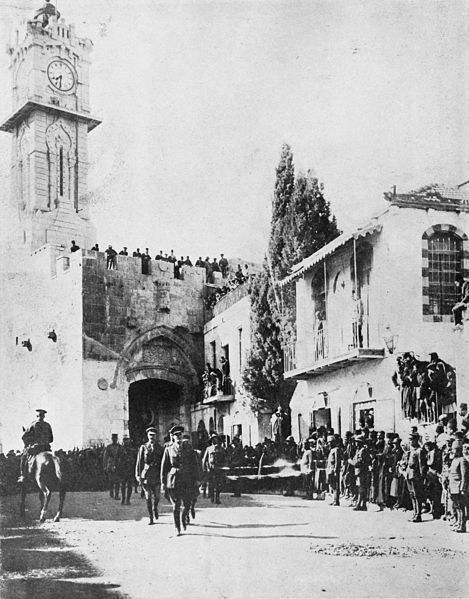 British General Sir Edmund Allenby entering Jerusalem on foot to show respect for the holy place (11 December 1917) (Wikimedia). Then there is Colin Bales, who provides fresh light on the debate over the extent and character of religiosity in the Australian community in World War I through an analysis of war grave inscriptions in Belgium and France. He argues that the evidence from these inscriptions shows both a stronger connection to traditional Christianity than some other historians had found to be the case and a growing sense of Australian identity. The closing article by Christopher Hartney, ‘Neither civil or secular: the religious dimension of Anzac’, revisits familiar territory but does so with an intellectual sophistication and verve and in a way that should revivify if not reframe the debate over the religious character of Anzac. He explores the placing of the Australian War Memorial and how it functions as sacred space and as a particular kind of sacred that is as marked by what it omits as what it includes. I hope that his discussion will reignite a controversy that will pay attention to his attempt to provide a more sophisticated account of the character of religion. Doug Hynd was a public servant. He has lectured in Christian ethics at Charles Sturt University and is currently undertaking a PhD in Theology and Public Policy at the Australian Catholic University.